While the builders have been here we’ve been catching up on a whole bunch of jobs, as well as dealing with things that have arisen as a result of the work that they’ve been doing. As previously mentioned they have partially re-built the garage. We call it a garage but it isn’t: the door to the street is actually fixed in place and is neither hinged nor in a position to open. 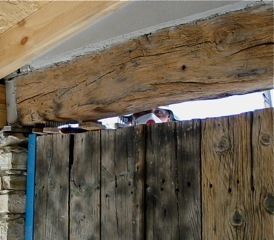 Anyway, part of its construction is a huge wooden beam positioned as a lintel above the door-that-isn’t-a-door. The beam is gorgeous, but filthy. So while the builders have been busy on the roof Ian took the opportunity to clean up the wood. The plan was to clean the whole thing with wire brushes, removing any debris and dead wood, then treat the wood with insect and mould repellent and then feed and protect the wood with a generous coat or two of linseed oil. The first phase was, without doubt, a horrible filthy job. But it provided a fantastic, and unexpected, photo opportunity. 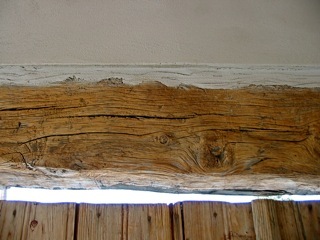 To give some context, this is the beam post wire-brushing. An unexpected treat today, we have an owl for company! Wandering through the kitchen today we glanced out of the window towards the possible hidden garden and through to the plot that has been partially cleared. 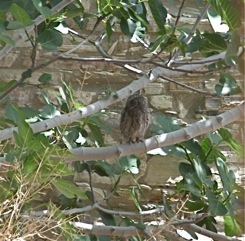 Sitting quite proudly on one of the branches of a fig tree was a small owl. Some time with a pair of binoculars and a copy of the invaluable Birds of the Middle East confirmed that he (well, we think it is a ‘he’!) is probably a Scops owl [Otus Scops Cyprius]. When we first spotted him we were concerned that our movements within the house would disturb him so we crept about to grab the binoculars, the camera, the bird books terrified that he might disappear. No danger of that; it seems Scops is here for some time. 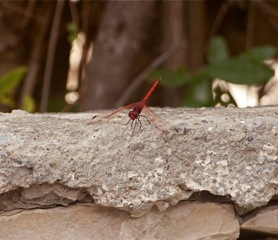 We first spotted him just after midday and as at 8pm he was still there. He’s changed position once or twice but other than that seems to be contented in his new home. Ian risked opening the back door to get a better chance of a photo. The owl opened his eyes a quarter way and raised his ears (or are they just ear tufts?) to listen. He must have decided that there was no threat as he was quickly back to his previous position. We’ve heard an owl in the garden area in recent evenings but not been able to identify it. Of late the occasional pellet has turned up. Now that we’ve seen him it seems likely that Scops has been around for a while. We have to wonder if the process of clearing the derelict patch has made it more inviting to an owl. Apart from our kitchen window the spot he has chosen is fairly secluded and not overlooked, but for us. For those who may be interested in such things, the author JK Rowling recently revealed that Ron Weasley’s owl is a Scops owl. Readers of the Harry Potter series may recall that the owl, Pigwidgeon, was described as being both very small and very over-excitable. This one is smallish but shows absolutely no signs of being so energetic; he appears to have been sleeping most of the day. According to Cypriot legend the Scops owl is one of the oldest creatures in the World, mentioned in conjunction with the Ark. The Cypriots have a tale that describes how the owl came by its cry. But the most characteristic feature is its wailing cry, a lament that brings back to memory the tragic story related to the origin of this bird. According to legend, the bird was originally the son of a poor peasant family who lived at the edge of a forest. He tended the garden and sheep while his younger brother looked after the horses. One day, when the younger brother was in the forest a severe storm arose. The boy returned home and when the elder brother counted the horses he found that one was missing. He did not count the horse on which his brother was riding. Flying into a rage, he ordered his brother to return to the forest and find the presumed lost horse. There, in the unleashed storm, the young boy was struck by a lightning. When later that night his horse returned home without him, his brother was full of apprehension. He went out in search of him, shouting his name “Ghioni”, “Ghioni” but to no avail. At daybreak, when to his utter distress he realized that his brother was dead, he asked Artemis, the Goddess of the forests and of hunting, to release him of his torment. The Goddess turned him into an owl. To this day, the owl flies through the forest all night long calling “Ghioni”. “Ghioni” for his lost brother. 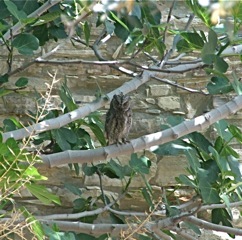 Incidentally, the modern Greek noun for owl is “ghionis” and the same word resembles the call of the owl. We can’t comment on that but it’s fair to say that we’ve made more trips past the kitchen window today, just to see if he’s still there. Days are a little longer, the air is a little sweeter; Spring has come at last. There are still cool and wet days and the evenings are a little chilly but we are getting a good run of day time temperatures. Out of the wind it can be gloriously warm, but by early evening a fire is still tempting. Sadly we’ve run out of firewood and all the local suppliers seem to have decided to stop selling for the year now that it’s a little warmer. After a couple of failed sorties we plan to try once more next week; the thought of no evening fires between now and November is just a little too much to bear. In the garden things continue to grow like there is no tomorrow. 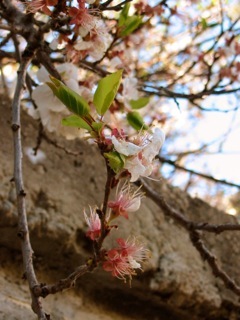 For a number of reasons we were a little late in pruning the citrus trees and the cost is a heavy one; instead of making rational decisions about where to cut we are traumatised by the idea of having to lose fresh blossom. Each beautiful flower is stunning in its own right but also a potential fruit and the idea of our own tiny orchard is still so fantastic that the loss of even a single, future, fruit is a heavy burden. Had we pruned at the right time, before the fresh blossom, then we could have avoided such angst. Yet another lesson for next year. When we did prune we kept in mind the tourists who walk past the house on their exploration of the village. 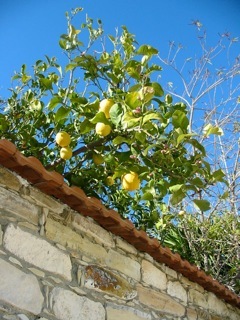 The gate lemon overhangs the wall on two sides and is a tourist-magnet. Many times we’ve heard, from inside the garden, discussions about whether it’s ok to take just one lemon. After all they are hanging into the street, they say. Once a married couple was heard discussing whether they actually were lemons or whether they were just too big. The husband was adamant that they couldn’t be, the wife wasn’t so sure. Ian took great delight in popping his head out of the gate to settle the argument and provide them with a single lemon for their evening gin & tonic. Clearly, if we wish our entertainment to continue then the tree has to be allowed some overhang into the street. 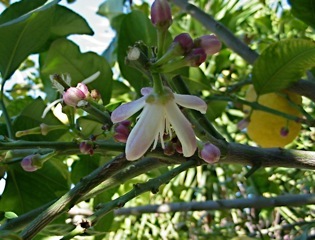 Next to the overhanging gate lemon is the yellow trumpet tree. After a quiet winter period it has started to come back to life. It’s fascinating to see the difference between the tree now and when it was in full bloom. Also outside the courtyard walls the wild fennel shows no signs of slowing down; the speed at which it grows is staggering. 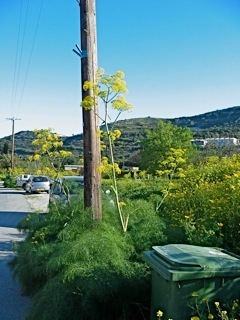 To give some context to photo below the green plastic waste bin is about 4 feet tall, the fennel is at least twice that height already. As the temperature increases it will die back and rest over the summer months only to re-appear in late autumn. 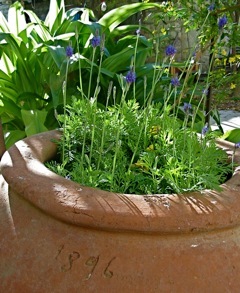 Within the garden the new lavender is finding its feet. With hindsight it might have been prudent to include fewer plants but the confines of the pithari should limit the growth. 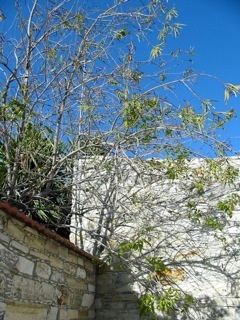 The mystery plant is gaining in height; from memory it flowered in early Summer last year. This time round we hope to have a chance to establish just what it is, as well as to move one of the two clumps to a more suitable spot. The section under the yucca tree seems to get insufficient light to be able to flower so a relocation is on the cards if we are able to lift it; an early attempt proved fruitless. Any finally, it appears to be snowing just along the donkey path. Clearly that would be madness, instead we have a gentle carpet of blossom from a large drupe tree in an neighbour’s garden. We have no idea what it is other than stunningly beautiful at this time of year. We’ve been so busy enjoying the sun and the garden that the monthly garden update is a few days later than usual. Finally, after a long and wet winter, the weather has started to improve. The tipping point seems to have been Green Monday and the start of Orthodox Lent. The day is a public holiday and it is traditional for families to get together and have their first proper outside meal of the year. It is meant to be the first day of spring, and this year it was. Since then days have been warm and dry; in our little walled garden we have seen temperatures as high as 24ºC, or mid 70s F.
This is not due to last sadly; the forecast for the second part of this week is for heavy rain and thunderstorms. Back to going to bed in the rain for a little longer then. 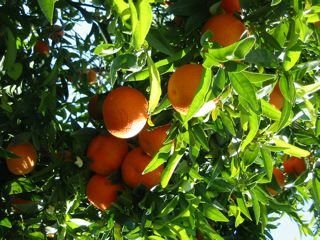 The plants and fruit trees have been flourishing with the warmer temperatures. 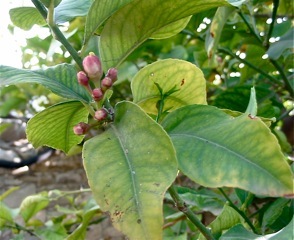 The lemon trees are in competition with each other to see which can produce the most growth as well as the greatest number of growth phases at once. We have a healthy crop of large ripe lemons. 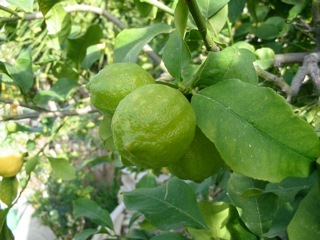 We have a decent second crop of small unripe green lemons. We have a crop of tiny just-pollinated green lemons, less than a centimeter wide. 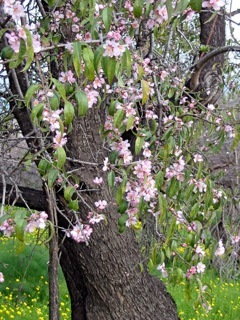 We have a small outbreak of early blossom. 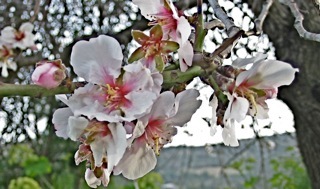 We have a large outbreak of main blossom. Oh, and the trees are putting on new leaf at a prodigious rate. Our builder stopped by last week and snorted in disgust at the sheer number of lemons we have. 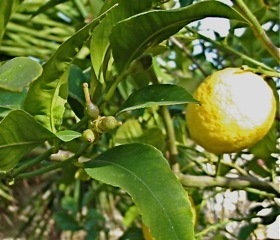 He, apparently, has six lemons on his entire tree. He waters his, prunes it, sprays it, tends to it and is currently debating when he’ll need to use his own patented potassium feed on it. We, on the other hand, turn a hose on ours when we remember. Which, frankly, isn’t that often. We bought some citrus tree food and some stuff for dealing with leaf curl but didn’t actually get around to using them last year. The packages were last seen under a pile of boxes in the garage; maybe it works by osmosis? As gorgeous as they are the lemons aren’t the only garden inhabitants. 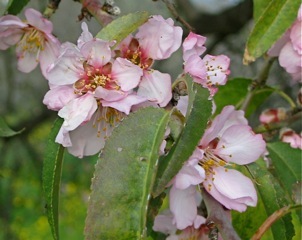 The peach has just started to set fruit; all being well we’re expecting a bumper crop of 7 fruit this year. With the weather a little better we finally braved the pithari. 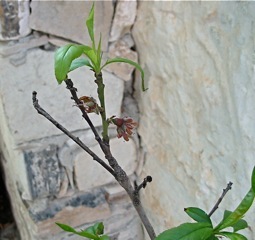 From what we have been able to establish MadAlex never actually planted anything in it, apart from broken house bricks. Things had fallen into it and rotted, including some of our clementines, and going on the number of cobwebs and the like it was home to a range of insects and bugs. We bought some plants to fill it but for the last month they sat forlornly to one side until we could summon the energy to dig into this four-foot high pot full of all sorts of nastiness. Last week we could avoid it no longer. To avoid any squeamishness lets just say we’re glad that the job is done and won’t need to be repeated. 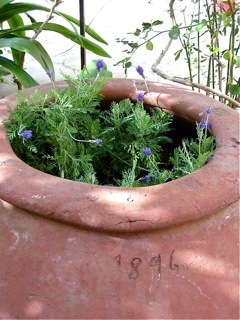 The pithari is now filled with lavender [Lavandula pinnata] which is currently clashing garishly with the bright yellow of the winter-flowering jasmine and the shocking orange of the clementines. Ian’s mother, Lucy, always loved fresh flowers and for her the stronger the colour, the better. There is no doubt she would have adored the fantastic, if unorthodox, combination of electric yellow, shocking orange and purple. Due to the growth cycle of each it is likely that we’ll only see all three together for a month or two each year. Some of the arum lilies that we removed from the base of the pithari were re-planted in one of the large containers we brought from England. They continue to grow well but so far are showing no signs of flowering yet. 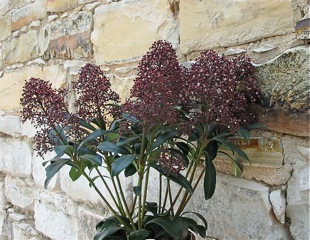 And finally, two mystery plants. One is a enigma we brought on ourselves; we were in a garden centre buying the lavender and spotted the plant. It looked interesting so we bought it. However we have absolutely no idea what it is. Before it gets a permanent home it would be helpful to know something about it so if anyone has any insights they would be much appreciated. The other mystery plant is one we inherited when we bought the house. 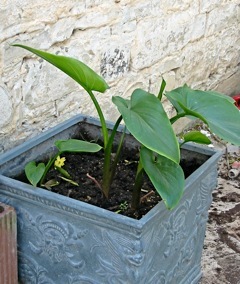 During his 90 second explanation of the garden MadAlex waved in its general direction and claimed it was a yellow lily. It isn’t, we know that much. Last year we watched in fascination as it grew, and grew, and grew. This thing puts on so much growth we joked that it was possible to see it increasing in height and volume during the course of a day. A plea for identification to an online gardening community produced mixed responses. 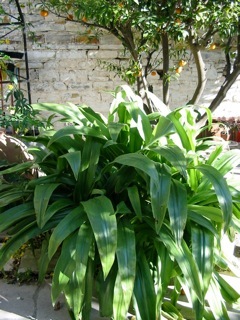 One gardener was insistent that it was a pineapple lily, another that it was an agapanthus. 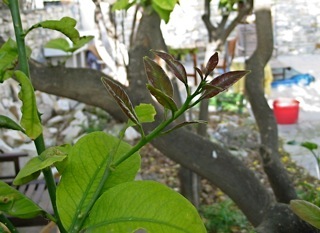 During early summer last year we spotted that it had produced a dozen or more slender flower shoots. They opened out to delicate white flowerheads with a sweet but subtle fragrance. 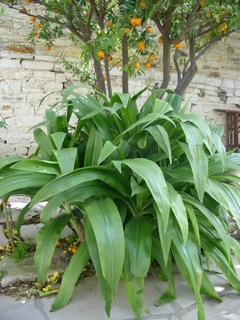 Certainly not a pineapple lily then and although the flowers had a agapanthus-like flower the foliage seems far, far too significant in size. The plant is already about four feet high; based on what we saw last year we expect at least another foot or more of growth yet. So, another mystery plant. We’d like to transfer some of it to another part of the garden but, once more, some identification would make that easier. Lilies, agapanthus or something else? 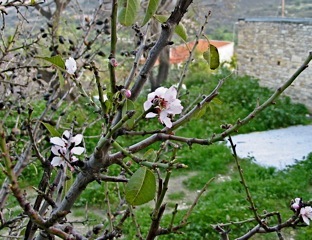 So, from the early spring of Cyprus we wish you all well. More from the garden next month. Suffice to say that the gamble paid off and we absolutely loved it. So much so that in 2008 and 2009 we went on exactly the same trip – the eastbound Transatlantic crossing on Windstar’s Wind Surf. Before that first trip, and in subsequent cruise planning, we’ve made great use of the Cruise Critic website. They provide forums for cruise lovers, and cruise newbies, to pool information. For lovers of the Windstar ships the Windstar forum is a fantastic resource. A while ago there was some discussion of the Transatlantic crossings including the relative merits or eastbound vs westbound, the passenger loads, the peace experienced onboard in the middle of the Atlantic with no other ships visible. This brought to mind that as part of the dozens of photos we’ve taken onboard Wind Surf we also have a very short video clip taken using the camera. It has no commentary, but it does give a sense of the peace of the mid-Atlantic. For those interested in technical details the camera is Fuji 6500FD. The footage was taken late morning on Monday 14th April 2008 from just outside the Compass Rose. For reference deckplans are available here. Notes from that day give the ship’s position at noon was 33 49N 031 21W. Nearest land Pico in the Azores, 310 nautical miles away. 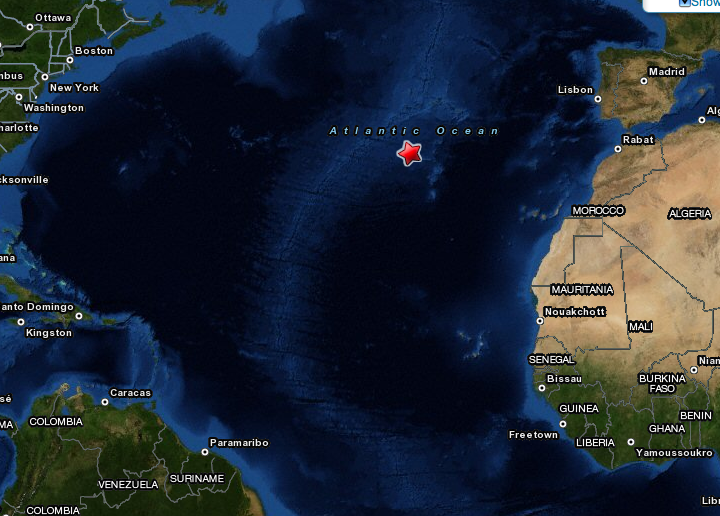 At that point we were approximately 2,050 nautical miles (nm) from our start point in Barbados. 14 days without sight of land, are you mad?! For us it is one of the most restful places in the world. 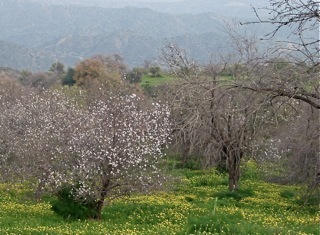 The drupe trees are very much in blossom. 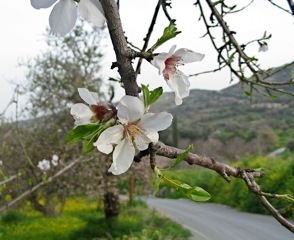 We still have no idea which blossom relates to which trees; come summer, when the trees have fruit on, we may have to sneak around the village and label the trees so that we can cross-reference next spring. 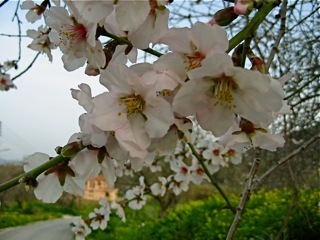 Right now from a distance the blossom is still indistinct, but up close the flowers are just beautiful.